The Disc Rotator™ is a new record player for 33/45 rpm vinyl records allowing playback of music with a sound quality to satisfy the most discerning of listeners in the world. The company is founded by the inventor of the Disc Rotator™ – Tomi Ekman in Järna Sweden. 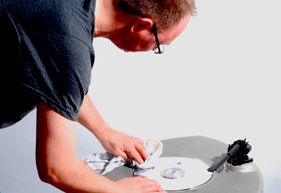 He developed it with the aim to produce the world’s best player of vinyl records and it was launched at the Stockholm High-End exhibition in Sweden 2011. Deviations in the supply voltage, differences in motor windings, friction in the hub bearing, defects in the turntable’s drive belt are only some examples of interference sources that affect the speed. All of them have to be controlled in order to provide the The Disc Rotator ™ with an exact rotation speed. All deviations from the correct speed must continuously be measured and subsequently adjusted so quickly that they are imperceptible. The record player has to maintain exact speed at every point of the audio playback. The Disc Rotator™ has a 3-phase top of the line EC-motor with an optical high precision encoder housed in a motor house made of 10mm thick aluminum with a highly advanced motor pulley & flywheel. Unjo used field-oriented torque/drive control (FOC) as the control strategy for a permanent magnet synchronous motor (PMSM) with a high-resolution encoder, which together with advanced signal processing optimize the precision. The technology allows a totally uniform moment over the revolution. In order to measure and control the speed with the rapidity required, more than 60,000 times per revolution, FPGA based control with very high precision and control bandwidth is used. Any rotational deviations are so small that they are impossible to detect using industry-standard measurement technology. 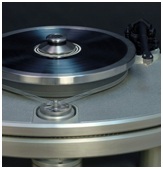 The Disc Rotator™ has world-leading properties in terms of its ability to reproduce music at precisely the right speed, thus giving remarkable natural music reproduction. It is not affected by any external sources of interference, whether occurring individually or simultaneously, as full control of the playback is provided at all times. “Thanks to its exact control of torque and speed, The Disc Rotator™ boasts the ability to reproduce music completely flawless without measurable wow or flutter”, explains Tomi Ekman, founder of company Disc Rotator Turntables. The Disc Rotator™ engaged Unjo to be involved in the product development work right from the very beginning of the project. At that time Unjo had no industry-specific references but after the very first trials it was clear that the final product would be extremely good. The solution has put The Disc Rotator™ in a class of its own, not just state-of-the-art.